LE MOYNE DE BIENVILLE, FRANÇOIS, soldier; baptized 10 March 1666 at Montreal, son of Charles Le Moyne and Catherine Thierry; d. 7 June 1691 at Repentigny and was buried at Montreal the same day. He was the fifth son of Charles Le Moyne de Longueuil. As a cadet, then an ensign, in the colonial regular troops, he may have taken part with his older brother, Jacques Le Moyne de Sainte-Hélène, in Governor Brisay* de Denonville’s campaign against the Iroquois in 1687. 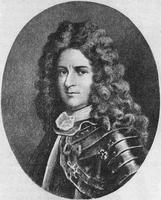 In February 1690 he accompanied his brothers Sainte-Hélène and Pierre Le Moyne* d’Iberville in the expedition against Corlaer (Schenectady, N.Y.). 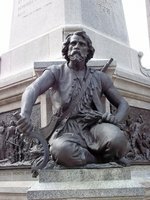 In the spring of 1691 he went in pursuit of the Iroquois who had been ravaging the region about Montreal since the beginning of May. With Philippe de Rigaud* de Vaudreuil and about a hundred volunteers, who had been recruited with difficulty, he set off at the beginning of June 1691 in pursuit of a band of Oneidas who were prowling about east of Montreal. Having located them in a deserted house in Repentigny, the Frenchmen decided to attack them during the night of 6–7 June. The Indians were resting unconcernedly, and about 15 of them were lying outside, near the door. These were massacred, but the slaughter alarmed those who were inside the house and they defended themselves vigorously after unsuccessfully proposing peace. During this engagement François de Bienville met his death, along with seven or eight comrades. Having come too close to a window, he was killed by a gunshot. But the enemy did not meet a better fate. Vaudreuil had the cabin set on fire. Eight warriors were killed when they tried to get out. Three were forced back into the fierce fire. This was one of the rare occasions during this war that the French were able to overcome a group of Iroquois on Canadian territory. François de Bienville was buried at Montreal. His title went to his brother, Jean-Baptiste Le Moyne* de Bienville, the twelfth child of Charles Le Moyne and the founder of Louisiana. AN, Col., C11A, 11, ff. 299–300. 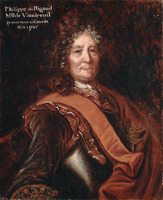 Ferland, Cours d’histoire du Canada, II, 233f. Frégault, Iberville, 128–40. A. Jodoin et J.-L. Vincent, Histoire de Longueuil et de la famille de Longueuil (Montréal, 1889), 149. Charles de La Roncière, Une épopée canadienne (Paris, 1930). Bibliothèque et Arch. Nationales du Québec, Centre d’arch. de Montréal, CE601-S51, 10 mars 1666, 7 juin 1691. Jean Blain, “LE MOYNE DE BIENVILLE, FRANÇOIS,” in Dictionary of Canadian Biography, vol. 1, University of Toronto/Université Laval, 2003–, accessed April 24, 2019, http://www.biographi.ca/en/bio/le_moyne_de_bienville_francois_1E.html.